The City of Brampton, Ontario, Canada is redeveloping its Public Works Yards to meet the future of Brampton’s growth, service expectations and commitment to a greener, cleaner environment. The City of Brampton’s Sandalwood Works Yard is a base used for road maintenance and snow clearing operations. In addition to servicing and maintaining roads, sidewalks and other City owned infrastructure, they plow and remove snow from the City’s roadways, downtown core Brampton Transit bus stops, bridge deck sidewalks, school crossings, and walkways. In the winter thousands of tonnes of snow, is loaded onto dump trucks and transported to the yard where it is stored and melted. 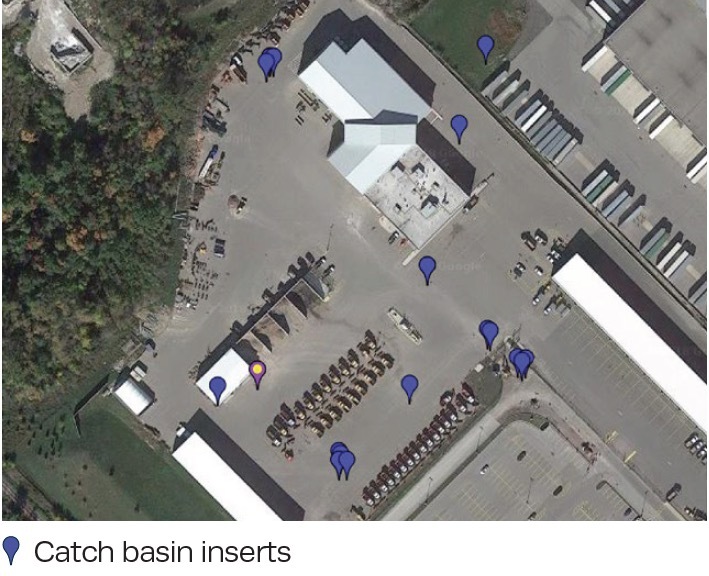 As a very active, high traffic yard all year round, the City saw the need to update existing stormwater infrastructure with retrofittable technology to manage the solid wastes, debris and stormwater contaminants associated with these essential services that is being transported to the Yard every day. Enviropod Canada in conjunction with their partners Imbrium Systems approached the Brampton Public Works team to trial the Enviropod technologies: the Enviropod™ Filter – a high performing catch basin insert and the LittaTrap™ – a low cost, hand maintainable catch basin insert. Both technologies are highly engineered for high performance and high flows. Two trial units were installed and monitored for 18 months to understand suitability across all weather conditions. The trial involved retrofitting the technology into existing catch basins at Sandalwood Works Yard and required no construction or disturbance to the existing infrastructure. After 18 months of testing these new technologies, the City has retrofitted the remaining thirteen (13) of the fifteen (15) catch basins in the Yard with six (6) additional Enviropod Filters and seven (7) LittaTraps. Different technologies were installed in different parts of the yard. The LittaTrap is a simple tool for managing plastics, gross solids and sediment in stormwater runoff. These were installed in lower contaminant generating areas.